Partnership between JDS Development Group & Ackerman Development. 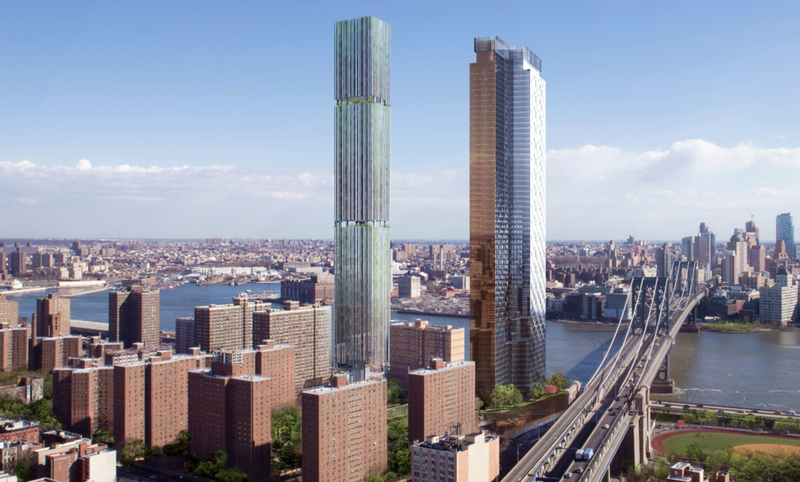 Clad in striking green terracotta exterior and floor to floor glass panels, this 77-story tower will stand at 1,013 ft, located near the Brooklyn and Manhattan bridges on the Manhattan's eastern waterfront. 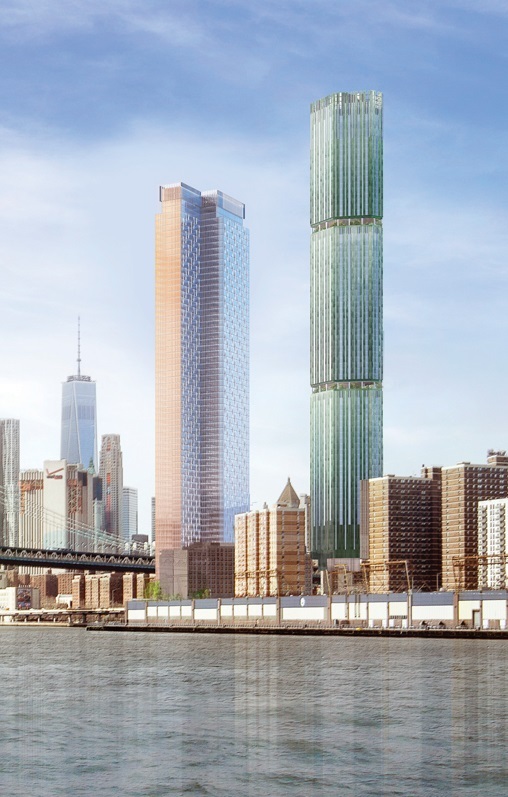 A portion of the tower will cantilever, allowing the expansion of the building with the footprint of the tower being only about 9,000 square feet. 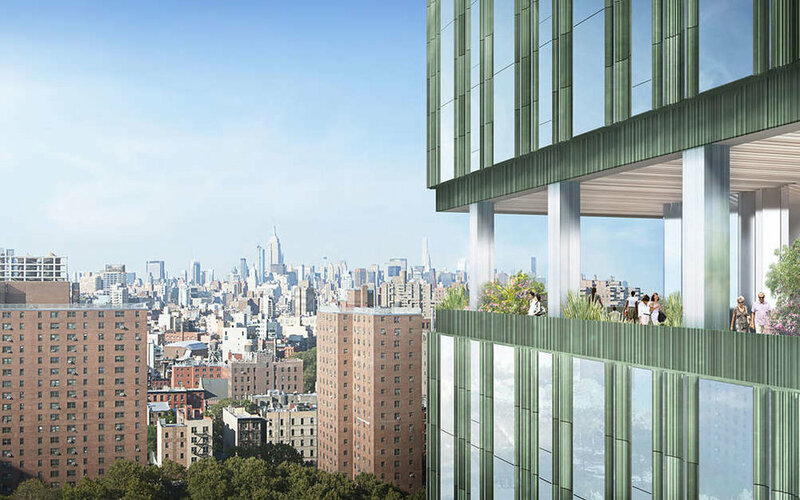 The tower’s design features several sky decks, a community garden and meeting space, including a plaza designed by SCAPE Landscape Architecture surrounding the tower's base. 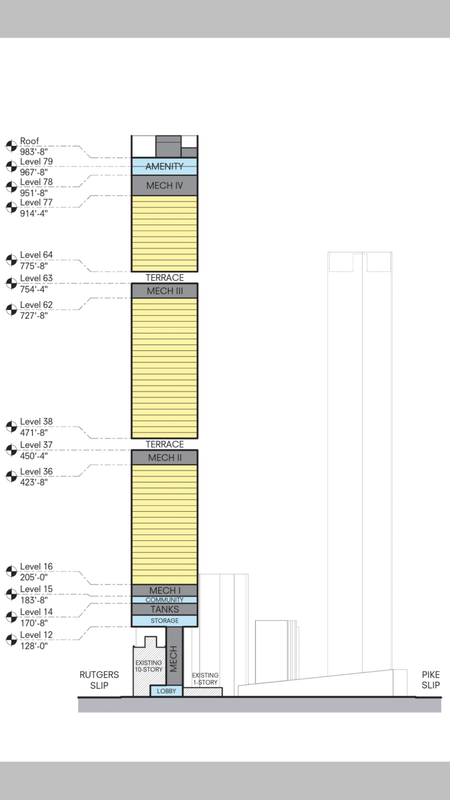 The 660-residence tower has 25% of its units reserved as affordable housing distributed throughout the building. Significant improvements will be made to the neighboring buildings, elevating the infrastructure and quality of life in the neighborhood including landscape design, new common spaces, 10,000 square feet of retail and environmental flood resiliency upgrades. This will ensure that the neighboring buildings remain a source of affordable, high-quality homes for the next generation. Upgrades to the senior center next door at 80 Rutgers Slip, includes flood-proofing the property and making upgrades to the lobby. In addition, creating an expanded 4,600-square-foot community center for seniors in the tower at 247 Cherry Street. The Two Bridges neighborhood has become an outpost of trendy restaurants and development. The pedestrian pathway connecting Cherry Street and Rutgers Slip will be redesigned with additional green space and amenities to support resident and community use, with approximately 2,500 square feet of new neighborhood retail at the corner of Cherry Street and Rutgers Slip. 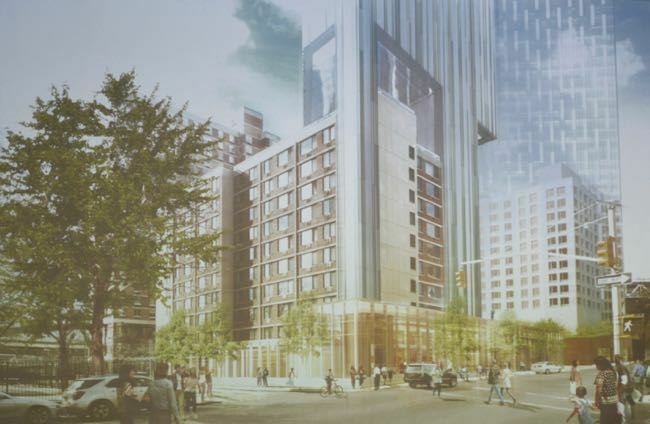 The 247 Cherry Street project helps to fund two long-standing community organizations—Two Bridges Neighborhood Council and Settlement Housing Fund—ensuring they are able to continue creating and supporting affordable housing in New York City. This innovative partnership can serve as a model for meeting the need for high-quality affordable and mixed-income housing.